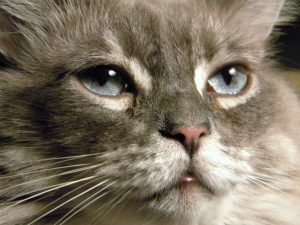 Last week I blogged about the recovery of a lost dog named Bill in my blog “Catching Bill.” This week I decided to appease the cat fanciers who read my blog by writing about the capture / recovery a missing cat named Cookie. Let me start out by saying that I love purple-lipped kitties (I happen to be owned by one myself)! Just look at Cookie’s face. If you love cats, how can you NOT love that face? So here’s the story of Cookie. It is an all-too-common story about an indoor-only cat that escaped outside, a frantic owner who didn’t know what to do, and a plea for help. On April 12th, we (Missing Pet Partnership) got the call from Amberly (Cookie’s owner) who lives in Renton, Washington. Cookie had slipped out the front door and had been missing for two days. 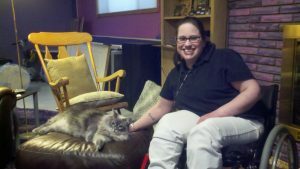 What set this case apart from others was that Amberly was wheelchair-bound and was not physically able to do the work needed to recover a displaced cat. And although Amberly asked us if we could respond with our search dog to try to track Cookie, we knew that was not necessary. We knew that Cookie was likely close and that more than likely, setting a baited humane trap would be the key to bringing Cookie home. We were right. An MPP volunteer (who wishes to remain anonymous) took on the Cookie case. She responded to Amberly’s home and posted giant, neon REWARD LOST CAT posters (in the pouring rain, no less) along with Amberly’s sister and friend. Amberly’s sister commented that there had been a “possible sighting” in the garage of a house directly behind Amberly’s home. The MPP volunteer walked over to the house with the possible sighting and spoke to the neighbor. The neighbor insisted that the cat was not in their garage and declined the volunteer’s request to search the garage. So, the MPP volunteer then coached Amberly and her family in how to follow up on any leads and told them to call MPP if they received any additional sightings. Days passed and Amberly grew discouraged. The MPP volunteer continued to encourage Amberly as best she could. The volunteer suggested that Amberly try to get permission from the skeptical neighbor to see if they’d let Amberly put a plate of cat food in the garage to see if it disappeared. Sure enough, the next day (on April 17th) after placing the food in the garage (which was gobbled up) there were multiple sightings of Cookie inside of that garage! (Cats are like that…my cats mysteriously surface every night for a taste of Friskies salmon!) However, when Amberly’s family approached the normally friendly Cookie, she ran and hid inside the garage and would not let them come near her. So Amberly called Missing Pet Partnership again. The same volunteer who’d responded with the signs responded again but this time with a humane trap. She took it directly to the neighbor who now realized that Cookie was inside their garage after all. The volunteer baited the trap with yummy food, set it inside of the garage, and then closed the door. Amberly’s mother was there and was confused as to why the normally friendly Cookie would run from her own family. The MPP volunteer explained displaced cat behaviors and how Cookie was behaving like any cat that was in unfamiliar territory. The volunteer instructed the family to leave the trap alone and check it in an hour, giving Cookie time to settle down in the garage, smell the food, and enter the trap. And that’s exactly what happened. Six days after her escape, Cookie entered that trap within one hour. She was only one house away (directly behind Amberly’s home) and wasn’t “lost” at all. She was displaced. But most importantly, because of Missing Pet Partnership’s services and the dedication of our volunteer, Cookie was back HOME, where she belonged! That volunteer returned the next day to Amberly’s house to pick up the MPP humane trap. She snapped the photo above of a very content cat (if there even is such a thing…I wouldn’t know because my cats are complete whiners) and a VERY happy Amberly. What I love about this story is that the services that our volunteer offered could be offered in ALL communities, nationwide. It would not require a trained search dog. It would not require high-tech equipment. There was no microchip involved in this recovery or phoning of neighbor’s to tell them to keep an eye out for Cookie. This was one trained volunteer who knew what to say, what to do, and how to instruct and encourage a distraught cat owner. That’s it. And that’s what Missing Pet Partnership is working to do. Working to build our organization that will train community-based volunteer pet detectives who’ll help recover lost pets like Cookie, one community at a time!